So, you want to be a Time Traveller? Messing with history can have its consequences. For starters, your world no longer exists. Then there are the paradoxes - holes in the Space-Time Continuum that threaten to destroy the Entire Universe. Can't find you way back tow your original reality? 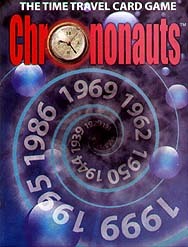 Then maybe you can win by collecting the right combination of amazing artifacts that only a chrononaut could acquire. So shuffle up this time-machine-in-a-box and start changing history! The basic premise of this game is that you are a time traveller trying to alter the time line to complete your mission. To start the game the time line is layed out as it actually happened then you play cards in turn to alter parts of history which will then allow you to alter other parts of history. This is a fun game to play but as I showed it is really all down to luck with which cards you pick up and which mission you have to complete.